We are now accepting submissions for the Spring 2017 edition of Movable Type, and would love to see some academic work from current undergraduate UVa students. 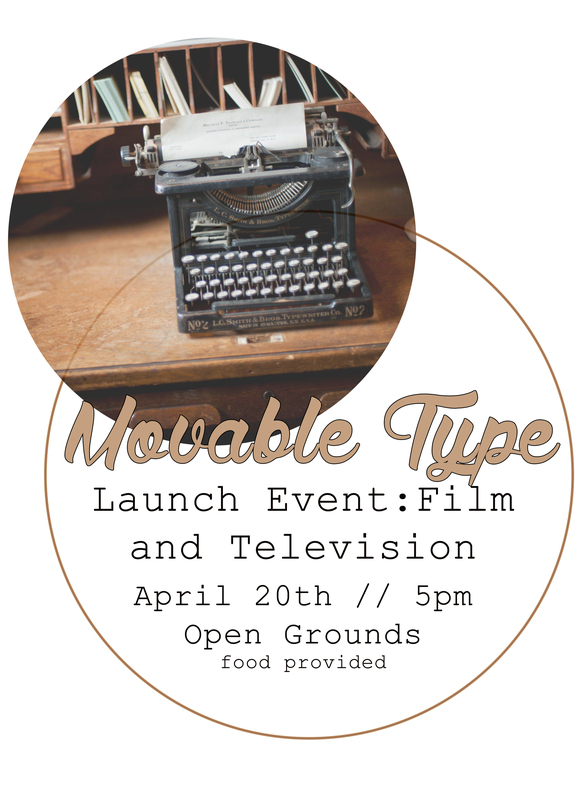 Please submit to movabletypeuva@gmail.com! Posted in Uncategorized on March 1, 2016 by movabletypeuva. Calling all submissions for our Fall 2015 edition of Movable Type! Please submit all media-related essays in Chicago style formatting to kws2at@virginia.edu by October 14. Posted in Uncategorized, Image format on September 17, 2015 by movabletypeuva. Posted in Uncategorized on April 14, 2015 by movabletypeuva. Calling all submissions for Spring 2015! 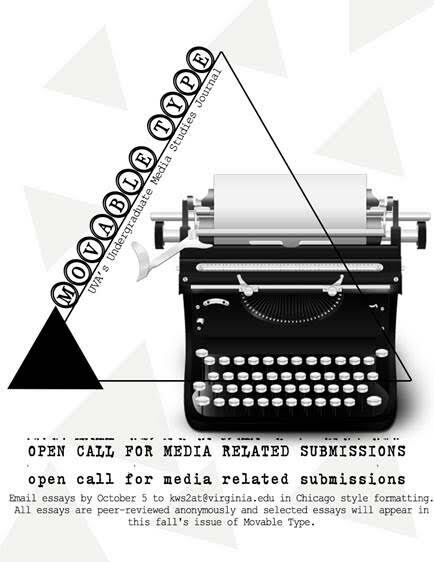 We’re now accepting submissions of essays in the media studies field for the Spring 2015 edition of Movable Type! 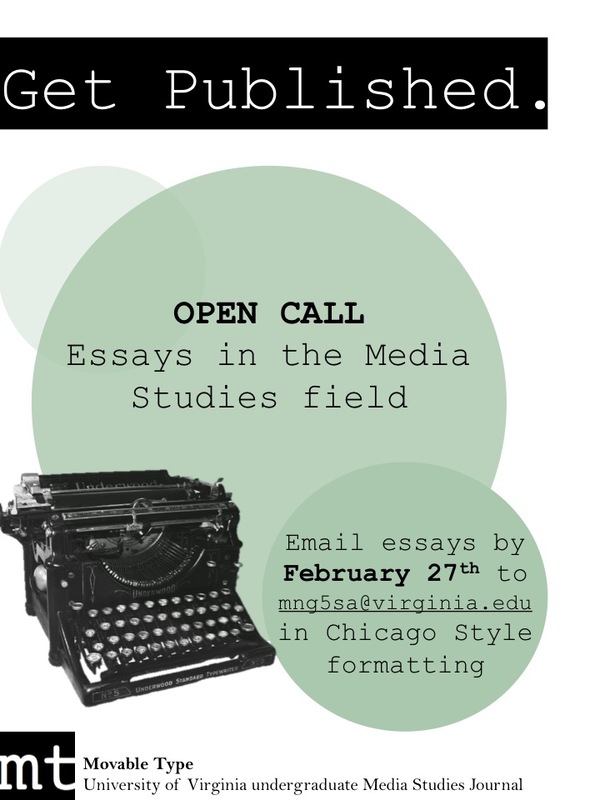 Email essays in Chicago Style formatting to mng5sa@virginia.edu by February 27th, 2015. Posted in Uncategorized on February 5, 2015 by movabletypeuva. Our Fall 2014 Launch event is Monday, November 24 from 5-7pm at Open Grounds. There will be food and lots of discussion about the work published in this edition, as well as the topic of gender and media in general. Have you written a paper about media and gender? Do you want to be published in UVA’s only undergraduate Media Studies journal? 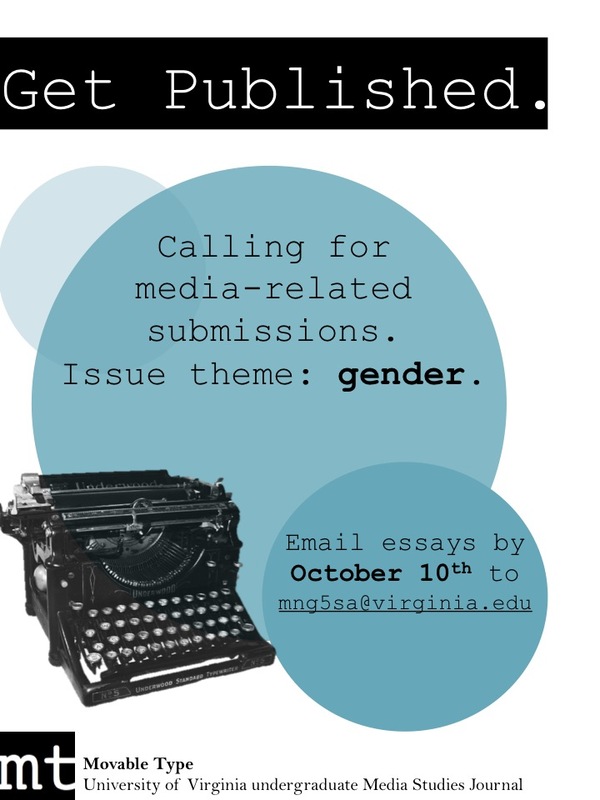 Send your paper to mng5sa@virginia.edu by October 10th and we’ll try to put it in the Fall 2014 issue of Movable Type!